BANGI, 22 Sept 2013 – Students must be prepared to face the working world once they graduated by having the extra quality that makes them stand out from the thousands of other graduates. 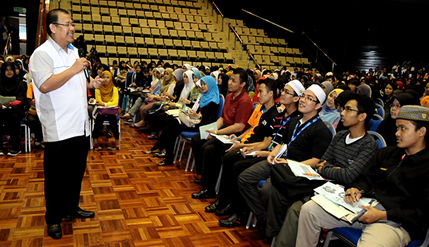 Deputy Vice Chancellor (Academic and International Affairs) of The National University of Malaysia (UKM), Prof Datuk Dr Noor Azlan Ghazali said this to new students of the university at a special briefing session on the Soft Skills Courses they needed to take. The students were today briefed by the university’s management and academics on the short courses which they must take while in the university. The briefing was also attended by Dean of Faculties, Principal of Residential Colleges, Heads of Institutes, Heads of Departments and other senior staff members. Prof Noor Azlan said the eight credit course is aimed at shaping and moulding them to be a complete package so that upon graduation, they will not only have the knowledge and intellect but also the practical skills to enable them to correctly conduct of themselves. Reminding them of the need to be outstanding in a crowded environment, he advised them to take the opportunity they have during the three or four years in the university to have the qualities needed to face the world. “Don’t just stay in class and sit reading your books. Go out, explore and reach out to people. Gain experiences and skills. Touch another person’s life and allow them to touch yours. The experiences or stories are what will make you different than the rest of your fellow graduates,” Prof Noor Azlan said. “There are many students who can get grades of 3.46 and above but what else? But if you are a medal winning athlete of the country and also a 3.46 grade student, that would be special. That is that extra something that employers are looking for.” he said. He also reminded them not to treat the soft skills courses as a burden imposed on them but should take it as another subject that is part of the course they are taking. “Be sincere and diligent in taking part in the activities within the soft skills courses. Do not simply think of it as waste of time. So, don’t think too much on the credits or completed hours of the courses but take it as a value or life lesson and experience,” Prof Noor Azlan said.